& Carmen Silvera in 'Allo! 'Allo! 'Allo! 'Allo! hit the small screen in 1982 and was to run for 10 years. 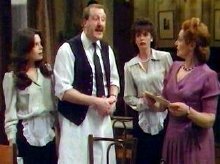 Gorden Kaye played Rene Artois, a French cafe owner in wartime France. Before he realises it, he is hiding 2 British airmen from the Nazis, but to remain alive and protect his busuness, he had to stay friendly with the Germans. Other TV shows in which Kaye made guest appearances were Till Death Us Do Part (1974), It Ain't Half Hot Mum (1977), Come Back Mrs Noah (1977), All Creatures Great and Small (1978) and Shoestring (1979). Kaye also had a part in 3 episodes of Are You Being Served, written by Jeremy Lloyd and David Croft, another of whose scriptwriting masterpieces, 'Allo! 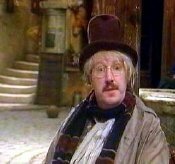 'Allo!, was to follow in 1982 and make Gorden Kaye's name known the world over. However, it is through television that Gorden Kaye is best known. His first 'big break' came in 1970 in Coronation Street. Kaye knew Pat Phoenix who played Elsie Tanner in the series, and it was she who got him the part of Elsie's nephew Bernard Butler. His first film part was in The Party's Over (1965) directed by Guy Hamilton and starring Oliver Reed. Small roles in later films include Escape From the Dark (1976), Sister Jessica in Jabberwocky (1977), Porridge (1979) and Brazil (1985). Gorden Kaye (born Gordon Fitzgerald Kaye) was born in 1941, in Huddersfield, Yorkshire. The unusual spelling of his first name is, according to Wikipedia, 'due to an Equity typing error' although Kaye says it comes from an error on his medical charts during a stay in hospital. He attended the King James Grammar school just outside Huddersfield, and later went to Huddersfield Technical College. Kaye's autobiography reveals him to be a "shy, gay and overweight boy" who found self-confidence and self-expression through acting. Wikipedia - All About 'Allo! 'Allo! In 1989, Gorden Kaye published his autobiography Rene & Me, co-written with journalist Hilary Bonner. The book is very readable and full of anecdotes obout other 'show-biz' people like Les Dawson and John Cleese. The book explains the furore that exploded in the tabloid press during the late '80s concerning Kaye's life-style and sexuality. In fact, the book wes written partly to answer much of the criticism that was levelled against him. In the years since 'Allo! 'Allo! finished, Kaye has worked mainly in live theatre, as in 2001 when he teamed up with Ken Morley and Vicki Michelle (from 'Allo! 'Allo!) for a 3-month national tour with a new comedy play, Business Affairs, co-written by Jeremy Lloyd. 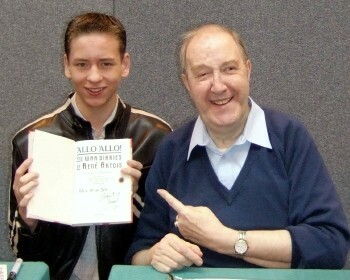 I met Gorden Kaye at the Birmingham NEC in August 2006. 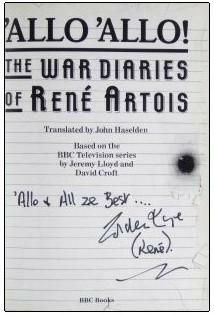 He signed the front page of my first edition of the War Diaries of Rene Artois for me. I talked to him for quite a while. He was telling me that all of the outside sequences for 'Allo! 'Allo! were shot in Norfolk, and the 'Nouvion Town Square' was really a cobbled courtyard at the back of the Lynford Hall Hotel! Gorden Kaye died in a care home, on 23rd January 2017.